President Drew Faust addresses the 14 veterans who participated in the Warrior-Scholar Project at Harvard. The week-long pilot program, which involved democracy-themed seminars as well as reading and writing workshops, ran from July 6 to July 12. Program director Logan Leslie ’16, a veteran of the Special Operations Forces and member of the National Guard, leads a seminar during the WSP course. The project, which debuted at Yale University in 2012, expanded to Harvard and the University of Michigan this year. Kenan professor of government Harvey Mansfield discusses Alexis de Tocqueville’s Democracy in America with the veterans. The WSP’s mission is to facilitate veterans’ transition into full-time students by helping them develop necessary academic skills while engaging with themes that speak to their experiences. When he entered Harvard College two years ago, Special Operations Forces veteran Logan Leslie ’16 faced a unique set of challenges. He was significantly older than any of his fellow freshmen, had not been in school for years, and had a family. “I ran into a fair amount of loneliness the first semester,” he says. “It was difficult to fit in.” After his freshman year, he decided to support other veterans in their transition from military life to college life. Beginning last summer, Leslie worked to bring the Warrior-Scholar Project (WSP), an intensive academic boot camp that debuted at Yale two years ago, to Harvard. The outcome of his efforts was a pilot program—which ran from July 6 to July 12—that hosted 14 veterans of the U.S. armed forces whom Leslie himself and the other project coordinators rigorously selected. The program’s goals, Leslie explains, are to expose the participants to the virtues of a liberal-arts education, to provide them with critical academic skills, and to encourage them to become active members of the universities they are about to join. A grant from the National Endowment for the Humanities and several donors ensured that the program was free for participants. 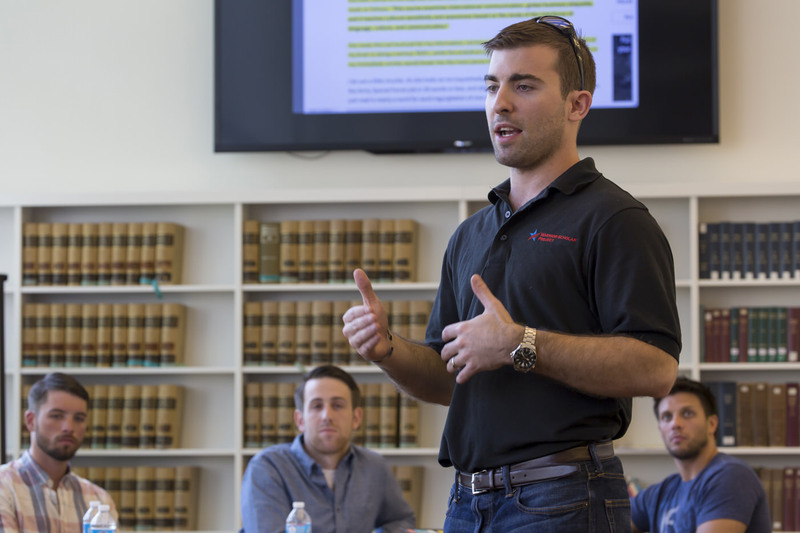 During their week at Harvard, the veterans spent their days at the Lewis International Law Center, developing their critical reading and writing skills and participating in seminar discussions with Harvard professors. 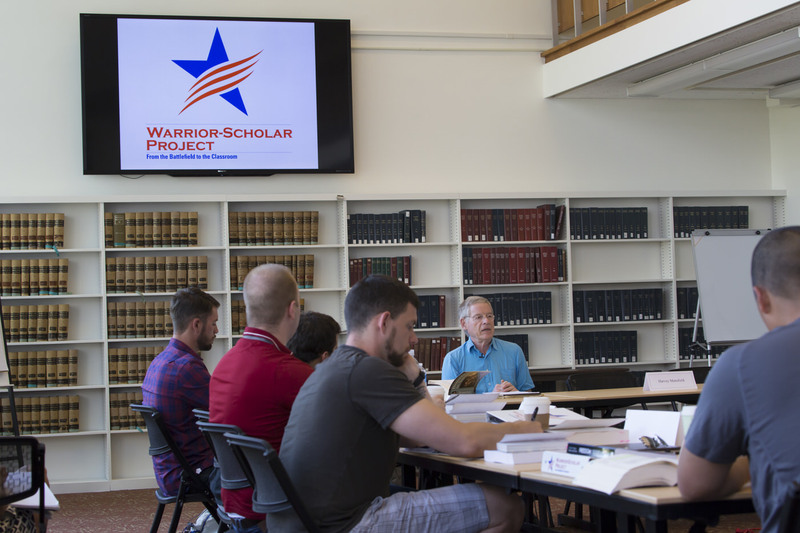 The reading lists, writing assignments, and academic conversations focused on liberty, equality, and democracy in the United States, a theme that “the veterans have a tangible and visceral connection to,” explains David Howell, who serves as WSP director of studies. (His brother, Christopher Howell, is the executive director of the project and a veteran of the Australian army.) “This is an extremely rigorous curriculum,” adds Leslie, emphasizing that program activities began at nine in the morning and ended late at night. Between reading workshops and meetings with their writing instructors, the participants had the opportunity to discuss authors and ideas with government professor Eric Nelson, Kenan professor of government Harvey Mansfield, history professor James Hankins, Kaneb professor of national security and military affairs Stephen Rosen, and the University’s chief technology officer, James Waldo. 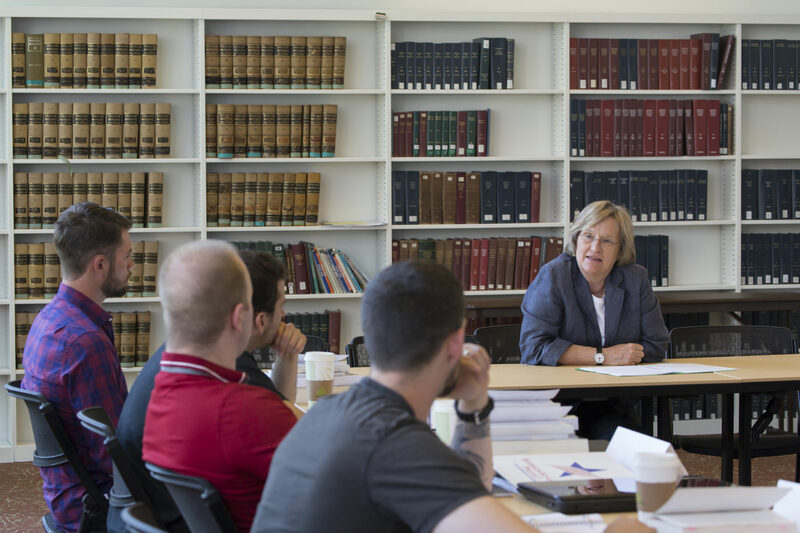 President Drew Faust, who has actively supported the Reserve Officers Training Corps during her time in office, spoke to program participants on Tuesday. In an e-mailed statement to Harvard Magazine, Faust expressed her hope that, as the veterans become scholars, they do not entirely abandon their experiences as warriors but enrich their college communities with those experiences. WSP participant Jared Smith, a 23-year-old veteran and incoming freshman at the University of Oregon, defined the program as a perspective-broadening experience. “The totality of my adult life,” he explains, “has been while I was in the military and while being deployed.” The highlight of the week, for him, “was getting to engage with all these amazing professors who are top minds in their areas.” In addition to improving their academic skills, the veterans who participated in the Harvard WSP program had the opportunity to reflect upon their emotional development. Summer Lee, a 21-year-old Warrior-Scholar who is preparing to apply to college, says that learning about “degreening,” or loosening one’s military identity to adapt to a new community, was for her one of the most valuable lessons of the program.